The Boston Magazine article has only been out for a few days, but it’s generating a lot of discussion, which I think is great. The biggest complaint I’m hearing and reading about in comments addresses the use of the word elite. I understand the criticism. 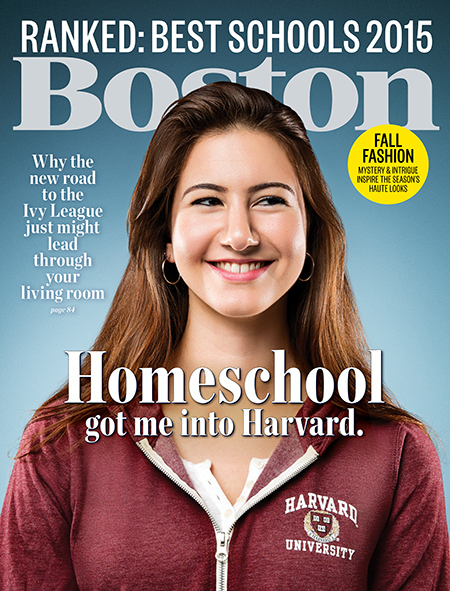 I cringed when I saw it, too, because when we decided to homeschool we certainly didn’t aim to make our living room into a yellow brick road to the Ivy League. Today Kerry McDonald posted a nice piece on the subject, and yesterday Tracy Ventola discussed it. Both these pieces point out that many of the families interviewed in the article are unschoolers, including mine. While I didn’t set out to get my kid into Harvard, I’m glad she’s there, for lots of reasons, not the least of which is the fact that it was the most affordable choice of all her acceptances. Mainly, though, I’m happy Claire is at Harvard because it’s where she wants to be. Claire spent her childhood reading, learning, engaging with the world, and pursuing her interests in the ways she chose to pursue them. That didn’t stop when she applied to college. My husband and I did our part for her application, which included working on the transcript, creating the school profile, writing the counselor recommendation, and filling out the FAFSA. The rest was her baby, and this is what I want to stress. As much as I’d like to take credit, I didn’t get my daughter into Harvard. She got herself into Harvard. Watching the process wasn’t a whole lot different than watching her become an accomplished jazz singer or land a position as a research assistant at a hospital, observing her younger sister nail an internship with a professional theater company, or seeing my son get himself volunteer jobs at the local science museum and Audubon sanctuary. These are examples of a few of my kids’ chosen pursuits as teenagers. By that time, I was in the position to kick back and enjoy the ride, loving their excitement about learning and marveling at their willingness to put themselves out there. The ride before that was pretty fun, too. Actually, the active engagement with the world my teenagers pursued was a natural extension of what they’d been doing all their lives. I can sum it up in a word: Play. That’s what they did most every day, and it’s pretty much what they still do. Pattern blocks, legos, dolls, sand, mud, unicycles, basketballs, Magic cards, juggling clubs, dress up, and my daughters’ beloved Calico Critters were some of the most valued educational tools we possessed. There were also the fruits of their imaginations, the made-up worlds they spent hours in, the drawings and songs and plays they created, the time to be alone to daydream, to think, to be. In the sense that it involves spontaneity and agile minds, talk was play, too, and we all participated in that, discussing books we read, places we went, things we saw and heard, issues we wondered about. Community was no small part of our unschooling. When kids wanted to do theater, a mom stepped up and created magical yearly productions. The first creative writing group I led happened because that same theater mom told me her son wanted to write, and she thought I might be the person to help out. Math sessions, literature groups, science clubs, camping trips, weekly square dances, park days and beach days and field trips galore–these all happened and more, all based on the interests, desires, and will of the people who organized them. While I chose homeschooling because I thought it would be best for my kids, I’d be lying if I didn’t admit that I wanted it, too. The lifestyle, which I’ve written about in the past and called slow homeschooling, was my choice for my life. So if playing their way through childhood, loving learning, appreciating people and the world around them, and pursuing what they care about makes my kids elite, so be it. I wouldn’t change a thing. 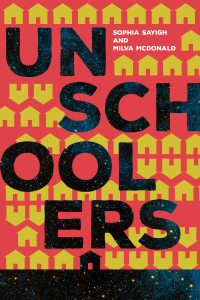 As my daughter enters her last year of homeschooling, we were reflecting about how much of her early years looked liked unschooling, even though we didn’t consider it at the time. Play of all sorts; many field trips, clubs, travel, pretend, dance, art, music, and most of all–following her varied interests and talents from antique collecting to acting. All of this play and discovery shaped who she is today. I have a question. Harvard is a school. You have avoided schools for so long, because you believe it is a suboptimal learning experience. There’s plenty of rote memorization at Harvard, and they certainly tell you what you need to study. If self-directed learning leads to the best education, why put yourself in a school situation? Hi Jane, I can’t answer for my daughter, but I can say that she’s an adult now, and this is the choice she made for herself. She’s been in school environments (community colleges) for years in classes that she chose to take. She likes academic pursuits. Undertaking this kind of education as a choice is quite different from spending one’s childhood made to do it. Rote memorization can also be self-directed. People can choose to memorize facts, formulas, and other information when they want to master or learn about something.